091001 – One 6.00oz. 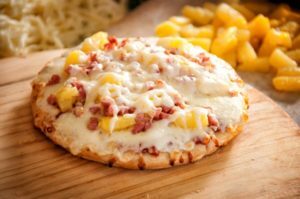 6″ Round Whole Wheat Hawaiian Brand Pizza Provides 2.00oz. Equivalent Meat/Meat Alternate, 2.00oz. Equivalent Grains, and 1/4 Cup Red/Orange Vegetable for the Child Nutrition Meal Pattern Requirements. For a crispy crust: Preheat oven to 325 F. Place pizza directly on center oven rack. Cook for 7 to 10 minutes or until cheese is melted and crust edges are golden brown. For a softer crust: Preheat oven to 325 F. Place pizza on a baking sheet. Cook for 8 to 11 minutes or until cheese is melted and crust edges are golden brown. Since 1942, Nardone Bros. has been committed to making the finest pizza and bringing the most nutritious, high-quality products to schools around the country. Several generations have handed down the knowledge and insight that goes into our pizza, and our company remains family owned and operated to this day.